How to revolutionize your life and business by giving booze the boot-from an entrepreneur who has done it. This article was written by The Oracles member, James Swanwick, who is an author, entrepreneur, co-founder of Swanwick Sleep, and CEO of The 30-Day No Alcohol Challenge. April is Alcohol Awareness Month. Let me be clear: I was never an alcoholic. I was a social drinker who enjoyed an after-work wine or two to unwind after a stressful day. On the weekends, I’d have some beers while watching sports with friends. But this habit of a few "innocent" (but regular) drinks took a toll. They made me feel tired and sluggish. I was unmotivated and irritable. I woke up during the night. I wasn’t performing well at work. (Excessive drinking costs the U.S. more than $200 billion per year, largely a result of lost work productivity.) I was growing a beer belly and becoming puffier in the face. I just felt average—maybe a five or six out of 10—in every area of my life. After waking with a shocking hangover at the South by Southwest Festival in 2010, I decided to take a 30-day break from alcohol as an experiment. Thirty days came and went, and I stayed on the wagon. I haven’t touched a drop of alcohol since. Here are seven things I learned. “I’m on a detox and taking a break from alcohol." “I’m good with water for now. Thanks." I never apologized for passing on the alcohol. I owned it and felt totally comfortable without drinking. When people saw my confidence and playfulness, no one thought that I was weird for not drinking; rather, they were impressed by my discipline. That discipline carried over to new business ventures. 2. I made new friends and contacts. 3. My social skills improved. With a clearer mind, I thought more about how I could help people, rather than how they could help me. I learned to engage people in conversation by asking questions like, “Tell me about yourself,” or “What's your story?” or “That’s interesting, tell me more.” I wasn’t relying on alcohol to loosen up; I was just relying on people skills, intense listening, self-assurance and confidence. 4. Good habits replaced the bad. New patterns can override old neurological patterns and habits, says Charles Duhigg in "The Power of Habit." By focusing on one “keystone habit” (not drinking), I taught myself how to reprogram other routines in my life. I ate, worked, slept, and saved money differently. I started waking up earlier to go to the gym or for a hike before work. Instead of having a sit-down meeting, I'd go for a run with someone instead. Making plans for early the next morning gave me a great excuse to go home early, get to sleep, and wake up early to attack a beautiful new day. This all resulted in better productivity throughout the day. 5. I handled stress better. Alcohol cravings are usually a response to stress, boredom or loneliness. When I felt that “need” to drink, I held my breath for 10 seconds and exhaled for 10 seconds. Or I took a brisk walk around the block and felt better in five minutes. Or I did 60 seconds of star jumps or burpees. Moving your body from a stressed emotional state to a huffing and puffing state relegates alcohol to the last thing on your mind. You can apply the same method to crush any craving when you need to get stuff done. Alcohol slows your metabolism. The body breaks down alcohol before fats and sugars. Alcohol contains a lot of empty calories. A pint of beer has about as many calories as a slice of pizza. Quitting drinking gives you the energy to be more active. I'm not saying that you have to quit drinking forever. But what opportunities are you sabotaging with a few "innocent" drinks? Building a business involves sacrifice. For some entrepreneurs, healthy habits are the first to be neglected. Meetings, emails, calls and extinguishing fires take priority. Not drinking transformed me—personally and professionally. And it will transform you, too. Try it. I bet you I’m right. And if I am, you owe me a glass of water with ice and a piece of lime. 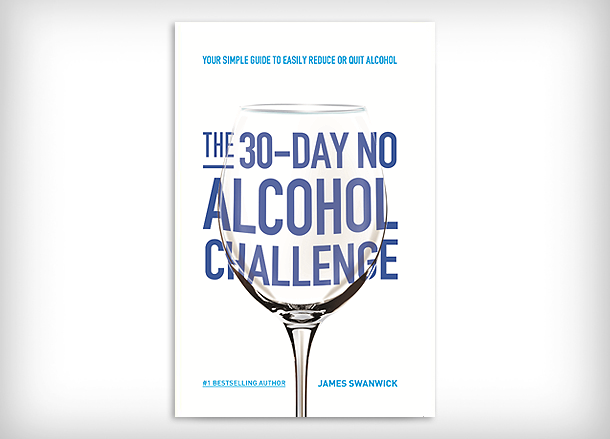 "The 30-Day No Alcohol Challenge: Your Simple Guide To Easily Reduce Or Quit Alcohol" is available now. Get your free book here and join the online program at: www.30daynoalcoholchallenge.com.